Birthplace: Mountain Creek House Fire was born in Chattanooga, Tennessee in 2012. Known for: Songwriting and down home feel. WoodSongs Dalton on April 30 at 8:00pm. Slick&apos;s Burgers - first and last Sunday of the month from 5:30-7:30pm. Background: Mountain Creek House Fire features Robert Lovett and Pattee Wilbanks playing Americana, bluegrass, classic country, and original tunes with roots influences. Robert, a Texas-born singer/songwriter with an Americana style, has recorded two original solo CDs that are inluenced by bluegrass and country blues. He comes to Chattanooga via Texas, Nashville, and Knoxville, and has found a home he loves here in the Scenic City. 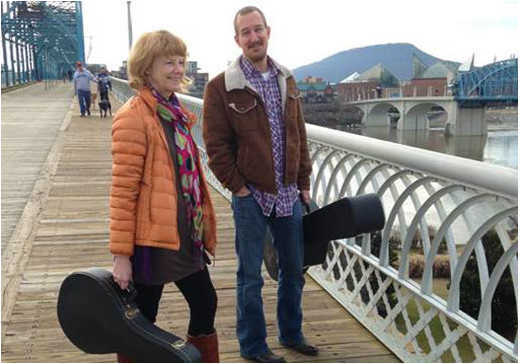 Pattee, who has been performing in Chattanooga since the mid-&apos;80s in various folk and bluegrass bands, plays guitar, mandolin, and clawhammer banjo as well as sings. She also writes beautifully personal songs with compelling melodies. The two have different, but complementary, writing styles that make this musical partnership shine. They have recorded an EP ("Can&apos;t Be Where I Am", and have a new CD ("Listen Local") to showcase their well crafted Americana songs. Their momentum has built and taken them to radio, tv, coffee houses, restaurants, festivals, and concert venues including the Nightfall series last Summer. Their shared passion for Americana continues to push their creativity and reach as a fine example of home grown Tennessee music.